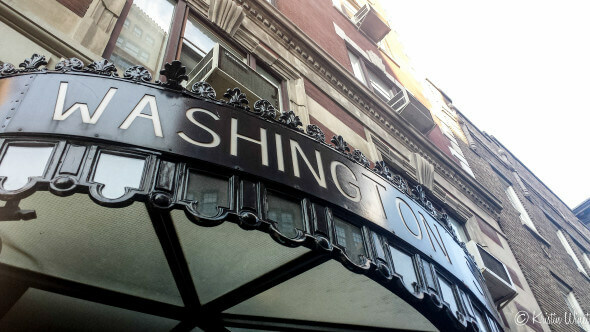 When you find out that Ernest Hemingway, Bo Diddley, The Rolling Stones, Chuck Berry, and Dee Dee Ramone all stayed in your hotel over the last 100 years, you might feel a little overwhelmed trying to find the best way to describe the little gem known as The Washington Square Hotel. And then when you discover that you are staying on the third floor, and that Bob Dylan and Joan Baez shared a room on this very same floor one night in 1964 while they were both passing through illustrious Greenwich Village, the stakes get just a little bit higher. What do you say about a fantastic little hotel frequented by some of the 20th century’s most influential artists, musicians, and poets? 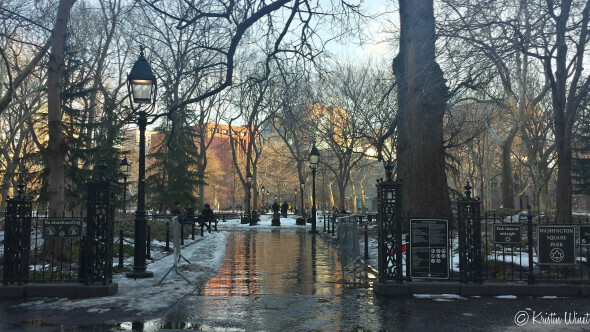 What can you say about a perfect little 9-story, 100-year-old hotel smack dab in the center of Washington Square, blocks from New York University, feet away from a snowy tree-lined park? To be honest, all I can do is simply add to the illustrious praise that this hotel gets on a day-to-day basis: Boston.com declares that “[i]f it was good enough for Ernest Hemingway, it’s good enough for me.” TimeOut New York writes that it “ooz[es] old world charm and romance,” and the UK’s Telegraph says that it’s “about as good as it gets.” At a price that’s supposedly affordable for the area (if $270/night for two twin beds can ever be considered affordable…), the Washington Square Hotel seems to be pretty much perfect. I don’t know what it is about New York City, about the rush of name-dropping, the pulse of the busy city streets, the eclectic row upon row of buildings full of boutiques, coffee shops, Irish, Italian, and Asian restaurants, the piles of grey snow pushed to the corners of the sidewalks and the chill of the fresh winter air…. But it’s there. It’s the kind of feeling that lingers, long after you’ve been there, that keeps gnawing at you to return, again, and again. 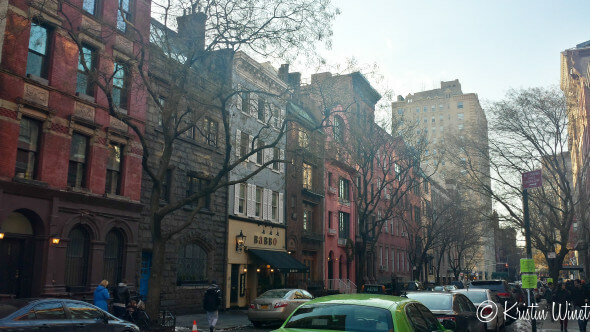 My trip to New York was short–I was there for just two days, and my sightseeing consisted of wandering around Greenwich Village, hanging out at Stumptown Coffee (an awesome local coffee shop around the corner from the hotel), and sitting on a bench reading a book in Washington Square Park. It was the kind of weekend that was both simple and pleasant. Ambiance aside, it’s probably worth sharing a few details of the rooms themselves. For one thing, the rooms aren’t huge–they’re quintessentially New York: small, historic, with visible plumbing, creaky windows, and squeaky floors. The room I stayed in (which had two twin-sized beds pushed together to make a queen), was just big enough for me, my suitcase, and my computer bag. They do have all the amenities you could want in a small hotel, including a Keurig coffee maker in every room, free Wi-Fi, a soft terrycloth bathrobe (I love my hotel bathrobes! ), a comfortable pillow-top mattress, and cable t.v. Though the beds are simple and the decor somewhat plain, there’s a certain intimacy here, as if you’re staying in a cute loft apartment in an old friend’s digs that just so happen to be in the heart of Greenwich Village. At the time of this review, summer rates for room reservations start at $270/night (for two twin beds or one queen) and go up to $415/night (for the Executive Suite). To reserve a room at the Washington Square Hotel, you can book online or contact the hotel directly at reservations@wshotel.com. You can also compare rates and book through Travelocity, Expedia or Hotels.com. 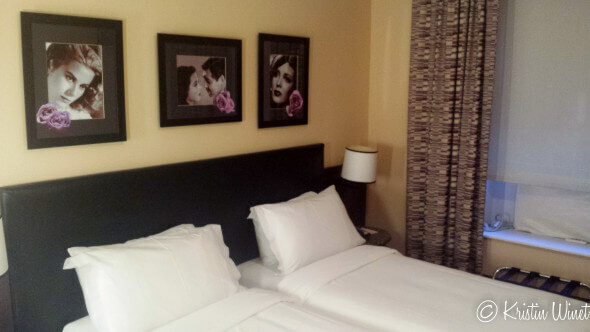 A special thanks to The Washington Square Hotel and NYU for hosting my stay.